Two-dimensional suprasternal echocardiographic image of supravalvar aortic stenosis. 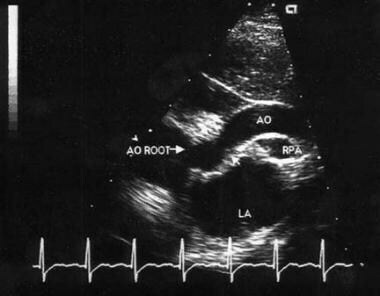 Aortogram of a patient with supravalvar aortic stenosis and dilated sinus of Valsalva. A less common presentation of SVAS is a familial form caused by autosomal dominant inheritance. Like the sporadic form, it is not a part of Williams syndrome. Go to Aortic Stenosis for more complete information on this topic. SVAS has 3 commonly recognized morphologic forms. 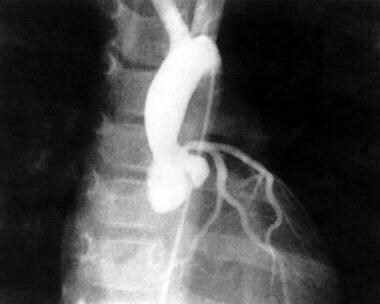 An external hourglass deformity of the aorta with a corresponding luminal narrowing at a level just distal to the coronary artery ostia is present in 50-75% of patients. In approximately 25% of patients, a fibrous diaphragm is present just distal to the coronary artery ostia. In fewer than 25% of patients, a diffuse narrowing along a variable length of ascending aorta is present. The origins of the coronary arteries proximal to the obstruction site have the same systolic pressure as the left ventricle (LV), which is abnormally elevated based on the severity of obstruction. Consequently, they become dilated and tortuous over time, with hypertrophy and intimal thickening. These changes predispose them to premature atherosclerosis. The hemodynamic consequences of coronary artery changes are increased total mean coronary flow but significantly decreased diastolic coronary flow, which is the major determinant of the development of myocardial ischemia. Concentric LV hypertrophy caused by SVAS exacerbates the problem of myocardial ischemia. In most patients, the jet of blood flow from SVAS has a preferential trajectory into the brachiocephalic vessels, the so-called Coanda effect  ; this accounts for a marked increase in the right upper extremity systolic pressure relative to the left. The precise etiology of SVAS is unknown. The disease’s high association with Williams syndrome, a genetic disorder caused by a hemizygous deletion or mutation of the elastin gene at band 7q11,  suggests that defective connective tissue formation contributes to its pathology. Patients with the sporadic form of SVAS may have associated peripheral pulmonary artery stenosis. There is no known risk factor for sporadic SVAS. As previously stated, a less common presentation of SVAS is a familial form caused by autosomal dominant inheritance. The crude incidence of congenital heart defects is approximately 8 cases per 1000 live births. SVAS accounts for less than 0.05% of congenital heart defects. The sporadic form of SVAS is more common than the autosomal dominant form. As previously mentioned, the sporadic form of SVAS is the most common (>50%) presentation. Postoperatively in this study, 73% of patients were in class I of the New York Heart Association's (NYHA) functional classification, and 27% were in NYHA functional class II. Most patients did not require reoperation. Prognosis is influenced by the presence of genetic disorders, coronary artery lesions, and associated obstructive lesions of pulmonary arteries. SVAS is a progressive lesion, whereas peripheral pulmonary artery stenosis remains unchanged or decreases in severity over time. The mortality rate is higher in patients with diffuse SVAS than in those with the localized form. The risk of sudden cardiac death, including in patients who have undergone surgery, is 1 case per 1000 patient years and is 25-100 times higher than in the normal population. Patients with SVAS are vulnerable to cardiac arrest or significant hemodynamic instability during induction of anesthesia secondary to hypotension and decreased coronary artery perfusion. Preoperative recommendations for restriction of physical activities should be followed (see Activity). Physical activity restrictions are not required postoperatively if no residual lesion is present (including coronary artery involvement) and the pressure gradient is less than 20 mm Hg across the LVOT, which is similar to the preoperative recommendation. In general, persons with SVAS should have risk stratification for coronary artery disease early in adult life, because SVAS may predispose the coronary artery to premature atherosclerotic changes. Micale L, Turturo MG, Fusco C, et al. Identification and characterization of seven novel mutations of elastin gene in a cohort of patients affected by supravalvular aortic stenosis. Eur J Hum Genet. 2009 Oct 21. [Medline]. Peterson TA, Todd DB, Edwards JE. Supravalvular aortic stenosis. J Thorac Cardiovasc Surg. 1965 Nov. 50(5):734-41. [Medline]. Edwards JE. Pathology of left ventricular outflow tract obstruction. Circulation. 1965. 31:586-99. Thistlethwaite PA, Madani MM, Kriett JM, Milhoan K, Jamieson SW. Surgical management of congenital obstruction of the left main coronary artery with supravalvular aortic stenosis. J Thorac Cardiovasc Surg. 2000 Dec. 120(6):1040-6. [Medline]. French JW, Guntheroth WG. An explanation of asymmetric upper extremity blood pressures in supravalvular aortic stenosis: the Coanda effect. Circulation. 1970 Jul. 42(1):31-6. [Medline]. Gersony WM, Hayes CJ, Driscoll DJ, et al. Bacterial endocarditis in patients with aortic stenosis, pulmonary stenosis, or ventricular septal defect. Circulation. 1993 Feb. 87(2 Suppl):I121-6. [Medline]. Wilson W, Taubert KA, Gewitz M, et al. Prevention of infective endocarditis: guidelines from the American Heart Association: a guideline from the American Heart Association Rheumatic Fever, Endocarditis and Kawasaki Disease Committee, Council on Cardiovascular Disease in the Young, and the Council on Clinical Cardiology, Council on Cardiovascular Surgery and Anesthesia, and the Quality of Care and Outcomes Research Interdisciplinary Working Group. J Am Dent Assoc. 2007 Jun. 138(6):739-45, 747-60. [Medline]. [Full Text]. Brown JW, Ruzmetov M, Vijay P, et al. Surgical repair of congenital supravalvular aortic stenosis in children. Eur J Cardiothorac Surg. 2002 Jan. 21(1):50-6. [Medline]. Wren C, Oslizlok P, Bull C. Natural history of supravalvular aortic stenosis and pulmonary artery stenosis. J Am Coll Cardiol. 1990 Jun. 15(7):1625-30. [Medline]. Wessel TR, Arant CB, Olson MB, et al. Relationship of physical fitness vs body mass index with coronary artery disease and cardiovascular events in women. JAMA. 2004 Sep 8. 292(10):1179-87. [Medline]. Pieles GE, Ofoe V, Morgan GJ. Severe Left Main Coronary Artery Stenosis with Abnormal Branching Pattern in a Patient with Mild Supravalvar Aortic Stenosis and Williams-Beuren Syndrome. Congenit Heart Dis. 2013 May 22. [Medline]. Martin R, Lairez O, Boudou N, Méjean S, Lhermusier T, Dumonteil N, et al. Relation between left ventricular outflow tract obstruction and left ventricular shape in patients with hypertrophic cardiomyopathy: A cardiac magnetic resonance imaging study. Arch Cardiovasc Dis. 2013 Aug-Sep. 106(8-9):440-7. [Medline]. Jureidini SB, Marino CJ, Singh GK, et al. Main coronary artery and coronary ostial stenosis in children: detection by transthoracic color flow and pulsed Doppler echocardiography. J Am Soc Echocardiogr. 2000 Apr. 13(4):255-63. [Medline]. Tani LY, Minich LL, Pagotto LT, Shaddy RE. Usefulness of doppler echocardiography to determine the timing of surgery for supravalvar aortic stenosis. Am J Cardiol. 2000 Jul 1. 86(1):114-6. [Medline]. Sugiyama H, Veldtman GR, Norgard G, Lee KJ, Chaturvedi R, Benson LN. Bladed balloon angioplasty for peripheral pulmonary artery stenosis. Catheter Cardiovasc Interv. 2004 May. 62(1):71-7. [Medline]. Dridi SM, Foucault Bertaud A, Igondjo Tchen S, et al. Vascular wall remodeling in patients with supravalvular aortic stenosis and Williams Beuren syndrome. J Vasc Res. 2005 May-Jun. 42(3):190-201. [Medline]. [Guideline] Bonow RO, Carabello BA, Kanu C, et al. ACC/AHA 2006 guidelines for the management of patients with valvular heart disease: a report of the American College of Cardiology/American Heart Association Task Force on Practice Guidelines (writing committee to revise the 1998 Guidelines for the Management of Patients With Valvular Heart Disease): developed in collaboration with the Society of Cardiovascular Anesthesiologists: endorsed by the Society for Cardiovascular Angiography and Interventions and the Society of Thoracic Surgeons. Circulation. 2006 Aug 1. 114(5):e84-231. [Medline]. Kavarana MN, Riley M, Sood V, Ohye RG, Devaney EJ, Bove EL, et al. Extended single-patch repair of supravalvar aortic stenosis: a simple and effective technique. Ann Thorac Surg. 2012 Apr. 93(4):1274-8; discussion 1278-9. [Medline]. Ayoub C, Ranasinghe I, Yiannikas J. Successful negative inotropic treatment of acute left ventricular outflow tract obstruction by elongated mitral valve leaflet. J Clin Ultrasound. 2013 Sep 20. [Medline]. McElhinney DB, Petrossian E, Tworetzky W, Silverman NH, Hanley FL. Issues and outcomes in the management of supravalvar aortic stenosis. Ann Thorac Surg. 2000 Feb. 69(2):562-7. [Medline].